For anyone interested in wine, this book is simply a must. First of all, it takes you into a rarefied world few us will ever have the chance to partake. There is that tiny upper echelon, in terms of income, who have the pocket change to buy bottles and bottles of rare wines and stoke cellars with thousands and thousands of bottles that no one person in a dozen lifetimes could ever drink. For your amusement, here is an example of verticals owned by Bill Koch, of the famous right-wing Koch brother industrialists: “95 years of Pétrus, 100 years of Latour, 120 years of Mouton, and 150 years of Lafite (as well as 33 vintages of Hennessy Cognac back to 1851).” Take that. Given all their shekels, it doesn’t make rich people any smarter than the hoi polloi who are happy to score a Burgundy for $5.99 at Trader Joe’s. In fact, it may make them kind of stupider. The psychology behind wine pricing is one of the dangerous influencers as witness this story. Experts relied on other ‘experts’ to validate both price and taste, and auction houses ended up making out like bandits. 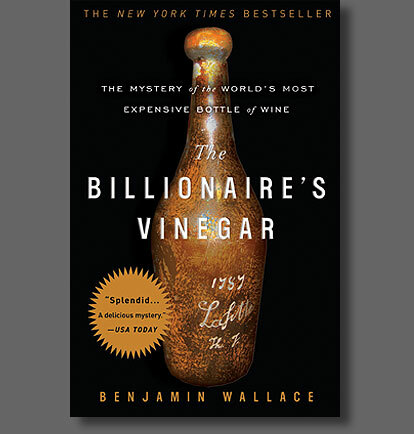 The whole story is fascinating and vastly troubling given the wine public’s reverence for Parker points, auction prices and deference to what wine ‘should’ taste like. The book starts and builds like a mystery thriller but races toward the end to wrap up what is unfinished business. I won’t give away why. It’s a tale of insecurity, ego-driven priorities and maintaining the status quo so as not to upset the apple cart. But it did anyway. Ah karma. Fascinating read. Good sumation of an exciting book.